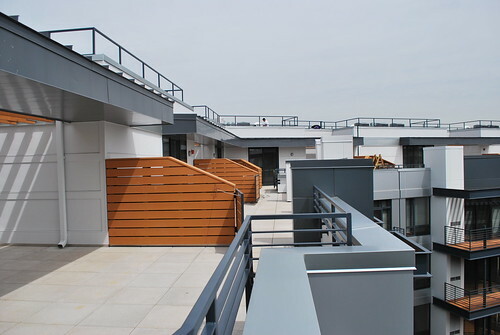 I had the opportunity to tour the newly opened Allegro Apartments at 3460 14th Street NW in Columbia Heights. The structure, designed by architects Eric Colbert & Associates, is without question one of the most interesting and visually striking new construction projects in the area if not the whole city. I've watched with interest over the last year as it has been built and I think the result is spectacular. It's deliciously modern design is appealing but tasteful. While I am often wary of modern structures mixing with DC's classic styles, I believe when it's done right the result can be excellent. The brick, steel and glass facade is interesting and unique, but thoughtful enough that I believe it will stand the test of time. It's hard not to like what they've done here. 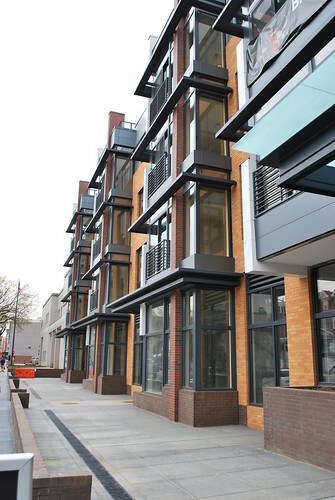 The location is a few blocks north of the DCUSA development, and the Allegro stands out as the first major new construction in Columbia Heights to open outside of the "downtown" area. Obviously it's still pretty convenient to the metro and the shopping, but not right in the center of things. The first floor of the Allegro is being leased for retail. One restaurant, Thaitanic II, has already leased space and will be opening this summer. The remainder of the space has not yet been leased. Hopefully this will change soon - as far as I'm concerned there can't be too many restaurants in Columbia Heights. From a selfish perspective I live about two blocks from here so I'm looking forward to having more entertainment and shopping options even closer than DCUSA. The Allegro is deceptively large - 297 units in total. 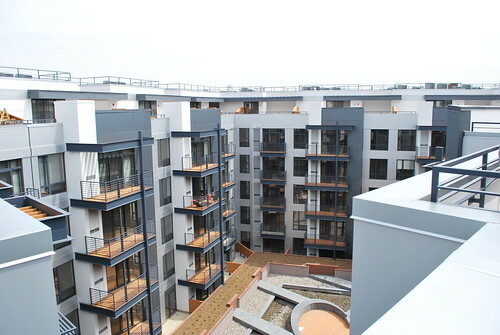 The structure is built around two central courtyards, and as a result nearly all the units have balconies or patios. Let me be clear: this is high end. The building was initially developed as luxury condominums, but like many developments in progress over the last year or two, converted to apartments as a result of the troubled economy. Unlike some others, however, the Allegro did not significantly alter the designs or build-out quality as a result of this switch. All the units feature granite countertops, high-end appliances, and a washer and dryer in every unit. Additionally, nearly every apartment's floor plan is unique. I saw a few different units and they aren't just different technically, they really do feel different. I think this is really cool because it means as a lessee you will be able to choose from a lot of configurations rather than the far more typical "one size fits all." I'm not going to say too much more about the specifics and amenities as you can get all the details from their web site. Let's just say it's pretty much got it all - free wi-fi in common areas (which I suspect means some tenants will be able to get online from their apartment, though it's not specifically provided for that purpose); 24-hour doorman; exercise room; public meeting spaces and common areas that can be reserved for private use; a public computer lab; access to the gorgeous courtyards in the center of the structure. And pets are allowed. Though there are apparently certain breed restrictions on dogs (I'm guessing pit bulls and rottweilers though they didn't say and I forgot to ask) there are no size restrictions. This alone should make the Allegro immensely popular. I have heard from friends time and time again how difficult it is to find a rental in DC that allows dogs and especially large dogs. Additionally, in the middle of the price range are a type of unit called "1 bedroom plus den," in the range of $2400 a month. I saw one of these and honestly, most people would call this a 2 bedroom unit. The "den" is easily big enough to be a bedroom, with the only downside being that the den may not have windows. And there is plenty of living space besides. What this means is that two people could comfortably share a "1 bedroom plus den" for and be paying about $1200 each, which is totally in line with what you'd expect to pay for half of a two bedroom apartment around here. And for a couple, the den would be a great guest bedroom. 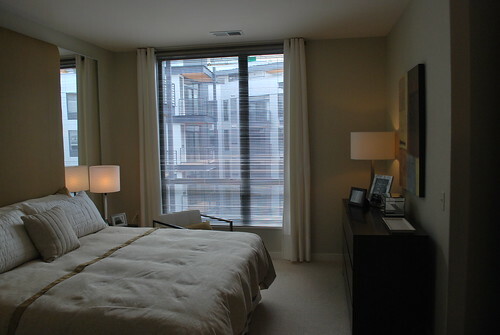 But you get a ridiculously swank living situation and all the amenities on top. So despite being at the high end, this kind of living might not be out of the reach of some mortals. Bottom line? It's gorgeous. I can't think of too many negatives about what they've done here. If I had to pick a shortcoming, I'd say the hallways are carpeted, and pretty bland. It feels a bit like a hotel. I am sure the carpeting is a practical decision, since a hard flooring surface like tiles would be noisy. This really isn't much of a complaint, I mean, it's just the hallway. The construction wasn't entirely completed when I did my walkthrough on Monday either, so I suspect that the final appearance will be more visually appealing either with paint or some other kinds of accent to mitigate the whiteness of the halls. Below are a few choice pictures, but there are many more in my flickr set for The Allegro. 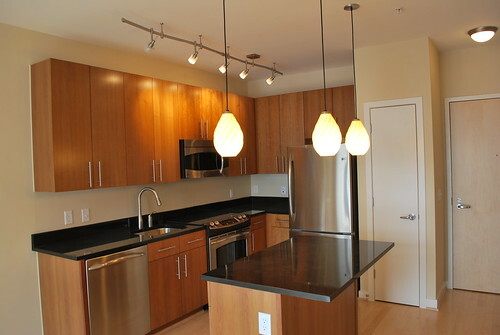 If you're looking in Columbia Heights in the $1500-$2500 price range (or you are filthy rich and want to live in a wicked penthouse), this place should be your first stop. Grand Opening Gala April 22: There will be a grand opening party next Wednesday, April 22, at the Allego lobby and courtyard with music, food and booze. 6 to 9 pm. Info and RSVP. Disclaimer: I was contacted by the Allegro about writing something for my blog, but I have not been compensated in any way and this writeup was not reviewed by anyone other than myself prior to posting. Obviously I'm a fan, but I am writing this only out of my own interest in the project and the neighborhood. All the photographs are my own. Below: One of the courtyards. The upper level of the main lobby. Yes, those are fireplaces. The first photograph under the body of text, actually, I thought was CGI. Took me a minute to realize it wasn't. Very clean and beautiful. I toured at Allegro this week. The property manager (Maj Roembke) is very nice, and I happened to meet the representative from their advertising agency (Michael Hammerstrom) who is a very attractive, ethnic, well-spoken young man who seemed incredibly passionate about the building and the neighborhood. Both gave me their cards and invited me to follow up with them, should I have any questions. Good to know that the people working behind the scenes are personally invested in Columbia Heights. I am seriously considering leasing here. Prices are in line with the competition. I live in the Allegro now and have had nothing but problems with the management, particularly with Maj Roembke. The level of service provided to me during move-in was very low and since then I've been snapped at aggressively more than once by Maj over things that are out of my control as a tenant. This is simply unprofessional in my opinion. The management excercises ZERO flexibility, and has yet to follow through with promises that were made more than 5 months ago. One thing that is particularly frustrating is the fact that Allegro managment has decided to subcontract a conservationist water company out of Texas that charges EXHORBIDANT prices for water. The water bill for one month in our 2.5 bedroom apt was $125+. Outrageous! Honestly, we do not use that much water, especially given that we are running GE high efficiency appliances. Just thought I'd share this with others. I want to add on to Anonymous' last comment about the poor quality of service that the management team provides at Allegro. I have lived there for 6 months now, and have run into many issues with the management: in can be summed up as general incompetence and a lack of respect for their tenants (maybe all of them, but certainly the younger ones, like myself, who they clearly take less seriously). When they gave me a broken parking garage opener recently--for which I am paying $200 a month, mind you--the management team, including Maj Roembke, not only did not offer an apology (a broken clicker is not a huge deal, but isn't an apology standard?? ), but rudely blamed the situation on me and refused to grant a reimbursement for the two days that I was unable to use the clicker to get into the garage--which also seems like a no-brainer. The concept of making their tenants happy and feel like a part of the community is foreign to these people, and I've had enough experiences with landlords and management companies in my life to know that their behavior is unprofessional at best. The apartment itself is lovely--albeit VERY small for its price tag--but I have to say, living there is not worth the headache of having to deal with the people who run the place. Also: The water company problem that Anonymous mentioned is spot on: Before moving in, beware of the HUGE water bill you'll be receiving each month. It makes the individual washer/dryer feature a lot less appealing. I recently looked at Allegro and really like the place. 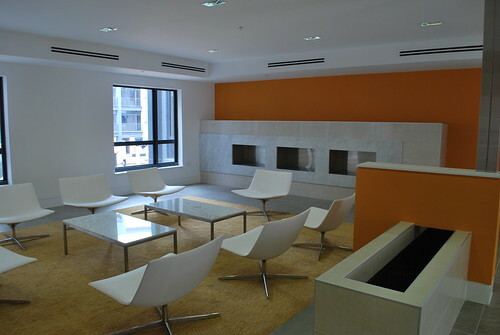 The apartments are on the smaller side but the amenities and overall quality of the building is very nice. It would be a stretch for me to afford the rent which is why I pressed the salesman on average utilities. He said he was not able to give an average due to the building being so new and then stressed the efficient appliances. Now I wonder what else he was hiding from me. I lived in a house with 6 people in DC and our water bill was never more than $85! Paying twice that by myself just so someone in Texas can line their pockets is not something I am remotely interested in. I am going to start deleting anonymous comments on this post because it seems pretty clear to me that it is being spammed by their competition, or a single disgruntled individual. The last three comments, all anonymous, appear to be the same poster. They all complain about utility bills, and have similar writing styles. I have no affiliation whatsoever with the Allegro, but everyone reading this should take these three negative comments for exactly what they are: anonymous. If anyone would like to actually IDENTIFY themselves and post about their experience with the allegro, positive or negative, please do so. Any further anonymous comments here will be removed. I can assure you the last anonymous comment was not by the same person(s) who wrote the first two. I left my comment as anonymous as I am seriously considering living there. That’s all, no ill will indented, just a statement of my experience. Perhaps when someone at Allegro reads them they will recognize that potential tenants have serious concerns about these issues and be more proactive in addressing them. As someone who is looking for a new place to live and seriously considering Allegro I stumbled across this site. Given the age of the building there are to my knowledge no other reviews from tenants available other than those posted here. Let’s be honest all apartments have their good and bad points, the latter of which always are talked about more frequently. Mind you, I take everything I read online with a grain of salt. Having an insider’s idea of how a place is run and being able to directly ask the leasing manager about other tenants concerns can be incredibly helpful. I am not on a mission to make a leasing manager uncomfortable when inquiring about problems with a property but let’s be honest I will be living in this space and I would like to know the good the bad and the ugly before I sign a lease. I am bothered that I specifically inquired about the utilities and the leasing manager glossed over them as though there had been no concern expressed by the current tenants about the rates. I am sure he was aware of the exorbitant water bills and I don’t appreciate his unwillingness to share this with me. Being direct about other tenants concerns gives apartment managers a great opportunity to show me how they have responded to these issues and how they will treat me as a tenant. Needless to say finding this info after meeting with them does not sit well with me. You can bet when I visit Allegro again I will be asking about the concerns posted here. I would honestly love to hear more about the place from current tenants as Allegro is among my top picks at the moment. I can relate to not wanting to post your info when you are still living in an apartment and don’t feel that the previous posts are that out of the norm or particularly damming of the complex. If you delete my post for being anonymous I will understand but the earlier posts are what brought me to your site and have been very helpful. I hope that is enough for you to post my request for more info on Allegro. --Is electricity included in the rent? --Do they recycle (PAPER RECYCLING? Bottles/ cans)? Life would be hard without paper recycling. --How much for a standard parking spot?